Between sickness, Week in the Life recovery (anyone just need a break from "documenting" after that intense week?! 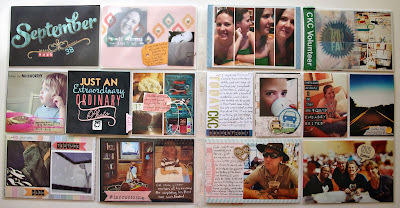 ), and regular life stuff I fell a couple weeks behind in my Project Life album. I decided I really hate that feeling! 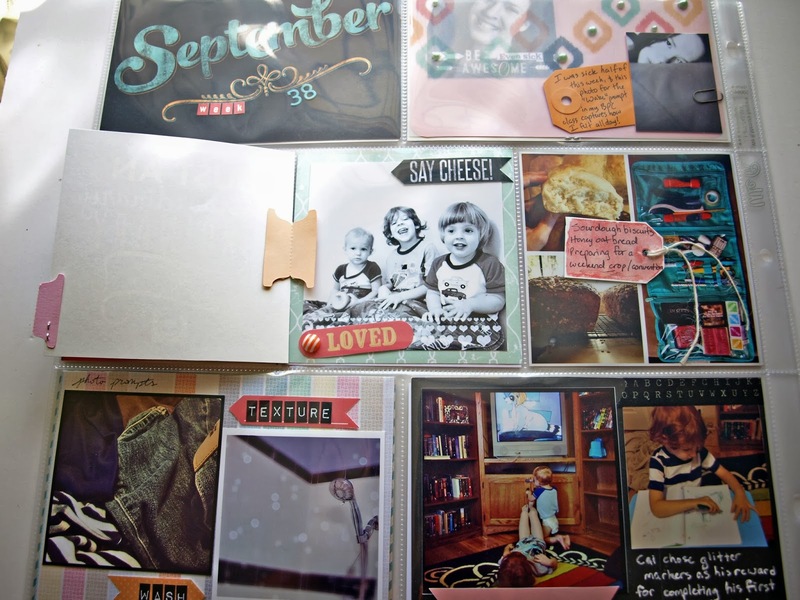 I had also run out of photo paper at home and had to wait for a sale to print the photos I needed to catch up. Still waiting on a few, but I did finish Week 38. This current week should be interesting to document, most of my family is sick, and we've had one calamity after another all week. From car to lawnmower, wedding ring to chair, things are breaking left and right. It's crazy! How do you document no-good-very-bad weeks? I'm not even sure I WANT to remember! I chose to use mostly Gossamer Blue for this week, especially since I finally had an opportunity to use the travel-themed stuff from August's Life Pages kit. 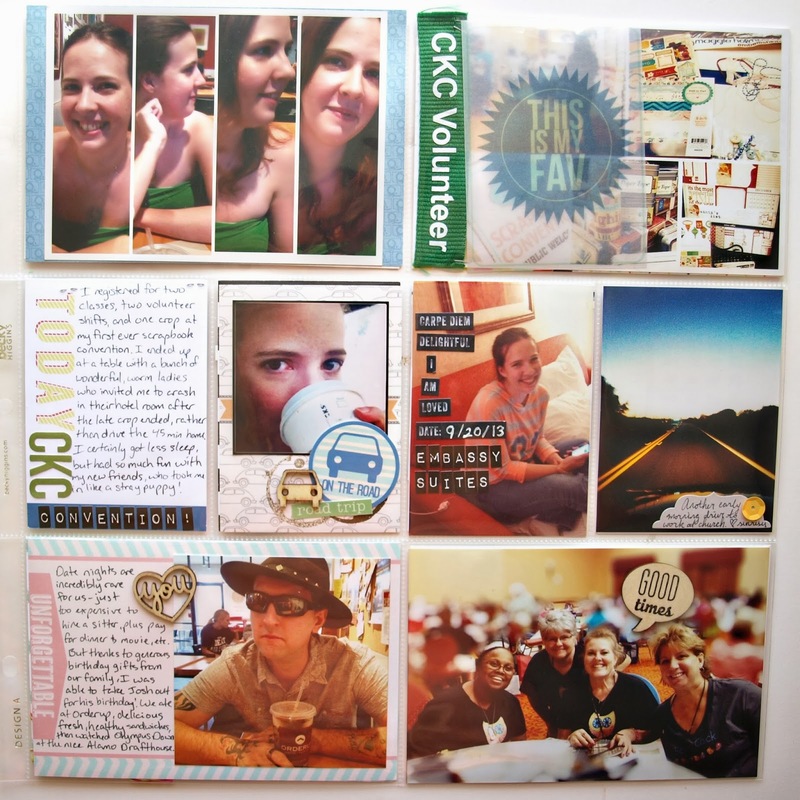 Josh graciously let me go to a CKC scrapbook convention Friday and Saturday, and it turned into quite the adventure! I ended up staying overnight in the hotel room of some ladies I met at the crop (not nearly as creepy as it sounds, I promise!) and we had a hilarious, fabulous time staying up way too late! 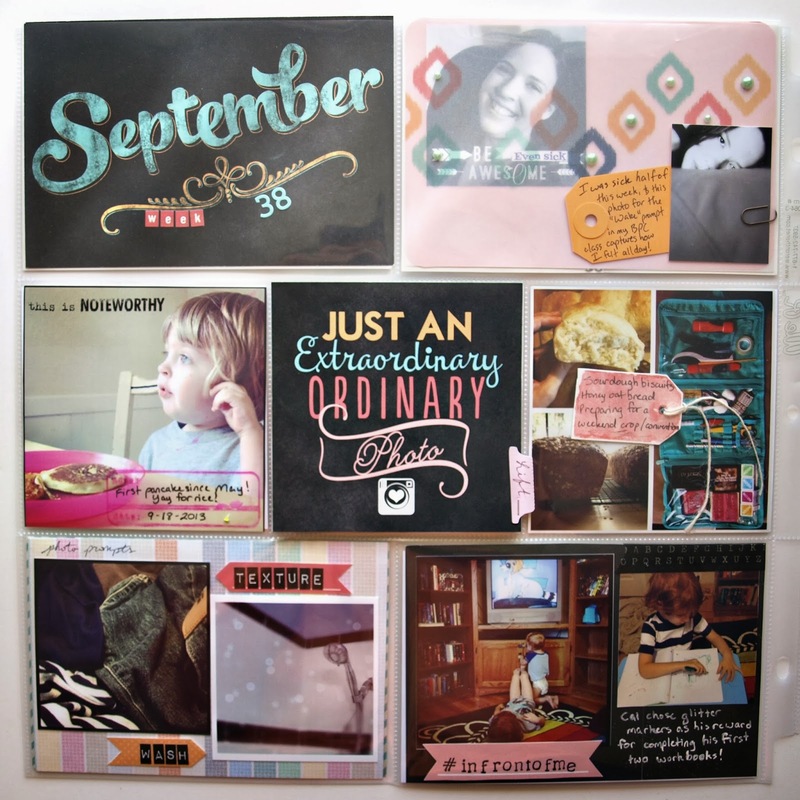 I really love that 4x4 Extraordinary Photo card - it was part of the printables for September's Life Pages kit (most of the stuff on the left side is from September's kit). Isn't that Traci Reed (who designs their printables, among other things) so talented?! I also figured out a way to use the cute 4x6 overlay. I think they're adorable but really struggle with actually using them in my spreads. If you have any ideas or examples, please share in the comments! Surprise! I hid an adorable photo of my boys, when they were actually being sweet to each other for .2 seconds instead of fighting, under that Extraordinary Ordinary Photo card! That pink tab is attached with a glue dot to the card and to the plastic page protector, letting the card flip up. Super simple. And that's another week in the book! I'm waiting on a 99-photo order from Shutterfly to finish weeks 39 and 40 (most of those photos are for my son's baby album - I did not take 99 photos in 2 weeks!). Hopefully by early next week I'll have those weeks posted and be more or less caught up again!